The Pittsburgh Penguins have had to deal with some major injury issues, but they're still among the best teams in the Eastern Conference. While the Buffalo Sabres can relate, their ability to regroup hasn't gone nearly as well. Pittsburgh, in a tight battle near the top of the conference standings, will again be without reigning league MVP Sidney Crosby on Wednesday as it tries to sweep its season series with struggling Buffalo. The Penguins (39-24-7) didn't have Crosby for more than six weeks because of a high ankle sprain before he returned last Tuesday. Prior to this game, though, Pittsburgh announced he would sit out after having pain in the same ankle during the team's morning skate. Crosby had an assist in Pittsburgh's 2-0 win over Tampa Bay last Tuesday, then added another in a 5-2 loss at Florida on Thursday. He played his best game since his return on Sunday, scoring two goals to help the Penguins win 4-2 in Washington. 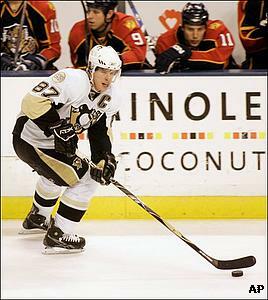 Pittsburgh is also without right wing Marian Hossa, who was acquired from Atlanta at the trade deadline. Hossa, though, is expected to be back from a sprained knee on Sunday. Pittsburgh's other young star, Evgeni Malkin, is in a battle with the Capitals' Alexander Ovechkin for the NHL scoring lead. Malkin has 92 points after his three assists on Sunday, and trails Ovechkin by three points. Malkin, however, will be without one of his linemates against Buffalo (32-27-11). Right wing Petr Sykora, tied for third on the team with 22 goals, will miss the game with a back injury. Center Maxime Talbot will also be out after re-aggravating an ankle injury on Sunday. Marc-Andre Fleury is 3-1-0 with a 2.05 goals-against average in four starts since returning from a high ankle sprain that sidelined him for nearly three months. Ty Conklin, however, won all three games against the Sabres in Fleury's absence, posting a 0.65 GAA and a shutout. For Buffalo, sitting in ninth place in the East, the injuries keep piling up and they're coming at a time where the team can least afford to lose anyone. On Tuesday, the Sabres found out they'd be missing a pair of defensemen for significant time. Jaroslav Spacek - who has nine goals and 22 assists - could miss the rest of the regular season and Dmitri Kalinin will be out for "weeks.". Buffalo has become accustomed to dealing with injuries to key players - forwards Jochen Hecht, Tim Connolly and Maxim Afinogenov have recently missed significant time. But the Sabres' situation on defense is becoming so dire that coach Lindy Ruff is considering using right wing Jason Pominville - the team's leading scorer - for some defensive shifts. "Our identity's going to have to be the underdog category now, and battle through adversity," Ruff said. Spacek and Kalinin were both injured in Monday's 3-2 shootout loss to the New York Rangers, dropping Buffalo to 1-3-2 in its last six games. Pominville scored just 16 seconds into the game, but the Sabres held that lead for just over a minute. "We got the start we wanted and got the early lead," said Pominville, who has seven goals and four assists in his last nine games. "The disappointing part is we gave it up again and we weren't able to play with it for too long." Buffalo did get some good news after the game. Defenseman Henrik Tallinder, who missed three games with a shoulder injury, is expected to play in Pittsburgh. Sabres enforcer Andrew Peters, though, won't play after being suspended by the NHL for one game without pay for a confrontation from the bench with New York's Colton Orr on Monday.